Humans have been at war with a race of robots called Cylons for a very long time. Suddenly the cylons call for a truce and peace negotiations ensue. During those talks the Cylons surprise attack and destroy all twelve (one for each zodiac sign) human planets and their military fleet. One lone Battlestar (sort of like an aircraft carrier) remains. It guides a ragtag fleet carrying the last survivors of humanity on a quest to find the mysterious planet known as the thirteenth planet (a thirteenth zodiac sign) called Earth. They hope that on Earth they will find the missing thirteenth tribe of humans who hopefully are powerful enough to defeat the Cylons.. 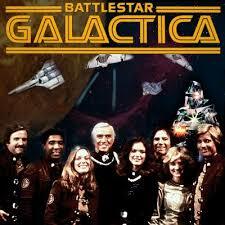 This fleet of civilians and military is led by Commander Adama (Lorne Greene). Capt. 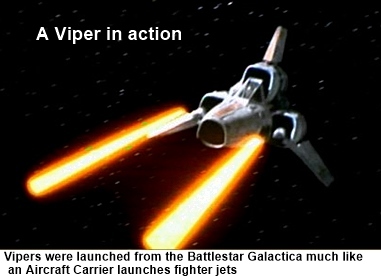 Apollo (Richard Hatch) and Lt. Starbuck (Dirk Benedict) are star pilots and along with a squad of Vipers (star fighters) they protect the fleet from the now pursuing Cylons. 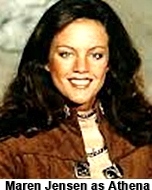 This show originally received great ratings and had a loyal fan base so to counter its popularity CBS moved its Sunday block of All in the Family and Alice an hour earlier, to directly compete with Galactica. Well that was enough to kill it. Since it was a huge expense to produce and its ratings fell so drastically against Archie Bunker, ABC canceled it. However that fan base remained and a lame attempt at a redo called Galactica 1980 was aired the following year to dismal ratings. 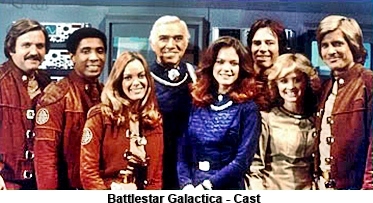 That same fan base still wanted Galactica so the entire series was reimagined with everything brand new and re-aired in 2003 for a successful four season run with Glen A. Larson back onboard.